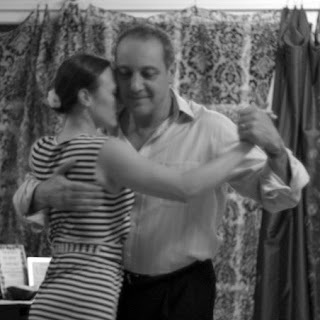 Instructors of Argentine Tango, Horacio and Marissa, have taught their classes at CORE Studios since 2003. Here's a short interview with them about their classes, which take place on Tuesdays with beginning level from 7:30-8:30 p.m. and more advanced from 8:30-9:30 p.m. You can find more information at their website Buenos Aires Tango Academy, and if you come to our Lunchtime in the Studio event, you could win a free class! Horacio says they teach Argentine Tango, which is a social dance version of tango, not one designed for shows or being performed on a stage. It's an internal tango, not a showy one. The emphasis is about the relationship to your partner and not about you and the audience. What got you into teaching and when did you start? Horacio first started dancing in 1969. His father is Sicilian and owned restaurants where there were often tango social dances and he encouraged him to dance at the events at a young age. He began teaching at his own studio in 1995. He moved to the US in 2002 and started teaching at CORE Studios in 2003. Marissa great up in Columbia, SC and did salsa in college. Her mom encouraged her to go to a Milonga (social tango event) in 2006 where she met Horacio on Halloween. She has been teaching with Horacio since the summer of 2008. Tell us a little bit about what the focus is for your classes? Horacio believes you learn from your body, not simply talking but connecting with the music and the lady. In Buenos Aires, space is more limited so it's harder to move, not like here. Classes should be fun and not so serious, should be based on the learning style of the dancer. Everyone can dance, it's not about showy moves, and you don't need to be slim or beautiful. It's a social dance. Milonga Buenos Aires, a dance party that happens the last Sunday of every month and Milonga el tango y tu which is the first Saturday of every month. Marissa also teaches at Oak Grove 1st grade and they donate classes and perform there. It feels like being at home, familiar and the studio is always being updated and renovated keeping things looking great.